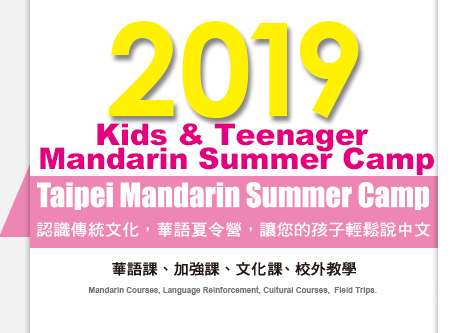 Mandarin Classes All students should attend placement test on first day of summer camp. After the placement test, school will set comparative grade and classified students into different levels of course. Mandarin classes are divided based on Age group (children and teenagers) and language level (Beginner, Elementary and Intermediate and advanced). Professional and experienced teachers are assigned by MLC. All students receive proper instruction according to their language proficiency. Cultural Courses Chinese cultural courses such as Chinese knotting, Dough Figurine, Kung fu…etc. will all be arranged in order to help students to understand Chinese art and cultivate study interest. Language Reinforcement As for listening, speaking, reading and writing enhancement, we design courses such as Zhu-yin & Pin-yin, Speaking, Word Recognition, Chinese Idiom Application and Essay Composition classes. Field Trips We will take students to explore the northern Taiwan scenic spots, which all have their own distinguishing local characteristics. These trips are designed to train students' observational skills, inspire their motivations for learning, and foster their appreciation of Taiwanese culture. Assistance for schoolwork Summer Camp students can stay at school after classes. Mandarin assistants will be with students to help with their studies. Student need to attend placement test on first day of summer camp (July 8 / July 29), please check in between 9:00am~9:30am. For parents, please join orientation start at 9:30 am. Graduation ceremony is on July 26 and August 16 morning. No class in the afternoon. Field Trip: 2 times each term; half-day or a whole day (depending on the distance of the place). In case of typhoon, classes or activities on that day will be canceled without making up the class or refund. ⊕Diversified Characteristics, help children to enjoy learning. ◎Solid Mandarin learning guidelines, concerning children's study and progress. ◎A variety of courses makes summer school more fun. ◎Both Pinyin and Bopomofo systems are taught in class. ◎MLC is the pioneer of Mandarin summer program and is an experienced Mandarin teaching specialist. ◎Courses and materials designed for summer camp children. Student Makeup Individuals, ranging from the ages of 7-9 and 10-13, who wish to come to Taiwan to learn Mandarin Chinese. Until both session are full. Discounts （A）Tuition fee NT22000 (USD 760) per session for new student sign up and complete tuition fee before March 31, 2019. （B）Tuition fee NT21000 (USD 730) per session for returning student. For register summer camp program, you can either sign up online or sign up on-site. Online application link: https://goo.gl/mEJduK or e-mail: mlc_camp@sce.pccu.edu.twfor more course information. Once application is complete, please press “ send out” button. After MLC received your application, MLC will email you online credit card payment link and will keep spot for a week. Please kindly complete payment in a week. If you have not received any email or reply from MLC a week after send out application, please contact MLC by mail: mlc_camp@sce.pccu.edu.tw or call us: 886-2-2700-5858 # 8131-8136. If the payment is not complete, MLC will cancel spot and provide to other applicants. MLC apologize any inconvenience may cause. After complete online application and tuition fee payment, MLC will email you scan of tuition fee receipt and registration No. Then your register is complete. Students who sign up summer camp successfully will need to hand in 2-inch photo and passport copy on first day of class (July 8 or July 29). While concerning about your children and arranging summer activities for them, do not forget to give yourself a meaningful holiday! Mandarin Learning Center offers a variety of learning programs for the parents who will accompany their children during their study. Parents could choose the most suitable course from the chart below according to your arrangement and interests. Group Class for Adult 6~15 persons in one class. This program helps students on listening, speaking, reading and writing skills. 3 hours class a day. *No class on summer camp field trip day. Individual class for adult Taylor-made classes. Materials will be chosen for your needs. Individual class for 2~4 people 2~4 parents could form a group to organize a particular Mandarin class and learn together. Custom time NT$650~NT$1,000 above per hour, Minimum 20 hours in total, with a minimum of 2 hours of class per week. Download "Application form for Parents Program"
Address： No. 231, Jianguo S. Rd., Sec.2, Taipei 106, Taiwan.